Tashi’s grandfather is not well. He used to tell her stories of how people in his village were cured by flowers. Tashi makes arrangements with a local nursery to bring her grandfather to sit among the flowers to make him better. He agrees but doesn’t get better. Mr. Wong the nursery owner asks him to come back the next week. When they go back the next week they serve all of the customer tea and cookies. People come to talk with him. In Tibet, people sit and visit in the gardens. This is what they call the “flower cure”. I love the book. The illustrations were beautifully done. The message of friendship and love carried all through the book. I know when I am sick that being out doors makes me feel better. 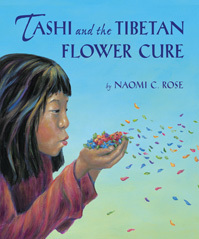 This is a wonderful book to teach about caring for others, as well as teaching about the Tibetan culture. There were a lot of Tibetan words used throughout the book. Great book.